The Faculty of Arts is pleased to present an annual lecture in honour of Woodrow Stanley Lloyd (1913-1972), a dedicated public servant of Saskatchewan. Woodrow Lloyd served as the province’s eighth Premier (1961-1964) and also as Minister of Education (1944-1960). It was in this capacity that he played a formative role in the development of the modern day education system. In 1963, he laid the cornerstone of the first building on the Regina campus of the University of Saskatchewan, now the University of Regina. Throughout his career, Woodrow Lloyd’s voice emerged as one strongly in favour of the university as a space for innovation and catalyst for social change. The Woodrow Lloyd lecture is presented each Winter by the Faculty of Arts and funded by the generosity of the Woodrow Lloyd Trust Fund. Each lecture features a nationally or internationally recognized scholar, writer, thinker, and/or activist, who speaks on issues of direct relevance to Saskatchewan. Past speakers have included former Premier of Saskatchewan Roy Romanow, noted climatologist Elane Wheaton, and author and Indigenous leader Cindy Blackstock. 2013: Can Civil Disobedience Ensure Health Care Access for Drug Users? 2012: Taking and Making Human Life: has healthcare replaced religion? 2009: Subprime Constitutionalism: Why are we over-invested in the charter? The Report of the Truth and Reconciliation Commission contained 94 Calls to Action that laid out a path to start the process of reconciliation. 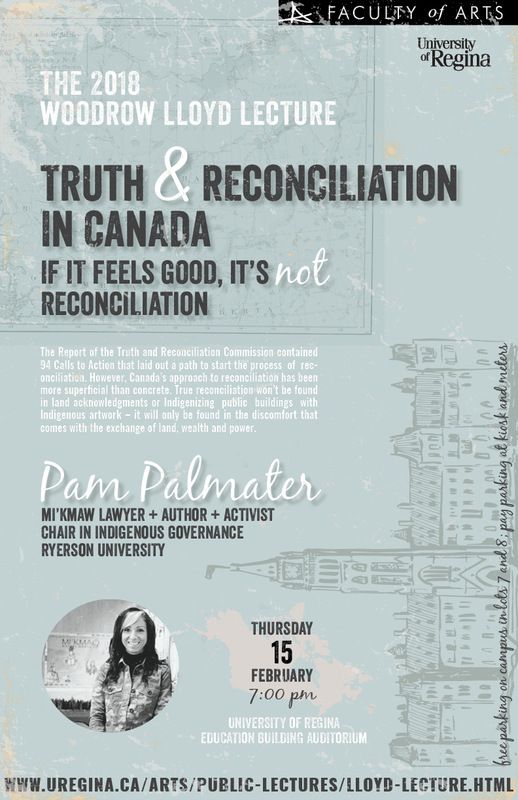 Yet according to Palmater, Canada’s approach to reconciliation has been more superficial than concrete. True reconciliation, she argues, won’t be found in land acknowledgments or Indigenizing public buildings with Indigenous artwork – it will only be found in the discomfort that comes with the exchange of land, wealth and power. Pam Palmater is a Mi’kmaw lawyer, author, and social justice activist from Eel River Bar First Nation in New Brunswick. She is a former spokesperson, organizer and educator for the Idle No More movement and currently holds the Chair in Indigenous Governance at Ryerson University. She has 4 university degrees, including a BA from St. Thomas with a double major in History and Native Studies; an LLB from UNB, and her Masters and Doctorate in Law from Dalhousie University specializing in Indigenous law. Pam has been volunteering and working in First Nation issues for over 25 years on a wide range of issues like poverty, housing, education, Aboriginal and treaty rights, and legislation impacting First Nations. She has worked as a human rights investigator at the Nova Scotia Human Rights Commission and worked collaboratively with human rights organizations like Canadian Human Rights Commission and Amnesty International on Indigenous issues. She is a well-known speaker and media commentator and is frequently called as an expert before Parliamentary dealing with laws and policies impacting Indigenous peoples, and before United Nations committees on human rights of Indigenous peoples, particularly, Indigenous women and children. Her recent focus has been on murdered and missing Indigenous women and girls and sexualized violence in policing. She has been recognized with many awards for her social justice and human rights advocacy on behalf of First Nations generally including the 2012 YWCA Woman of Distinction Award in Social Justice; Canadian Lawyer Magazine’s 2013 Top 5 Most Influential Lawyer in the Human Rights category; Margaret Mead Award in Social Justice 2016; J. S. Woodsworth Woman of Excellence Award in Human Rights 2016; and an Alumni Award of Distinction 2015 and honourary Doctorate of Laws from UNB 2016, as well as the 2017 Award for Excellence in Human Rights from the Atlantic Human Rights Centre at St. Thomas University.